I needed a nice simple material to "tone down" the kit, this seemed to do the job fairly well, while still having a "nicer" blank to complement the components. Black Ebonite from Exotics (I just love their stuff, and unbelievable service ) and Black Ti Majestic. No finish, just MM to leave that great ebonite feel and patina over time. This is the first time I used this material and I have to give thanks to Kurt Huhn (pipecrafter) for an EXTREMELY helpful tutorial I ran across on here. It explained the problems most people have with it and how to avoid them. I highly recommend reading it if you are about to turn this for the first time, as it acts quite differently than other materials. Thanks for looking and any feedback, positive or negative is always appreciated. It's beautiful, and I couldn't agree more that the ebonite helps to tone down that kit appropriately. Ya got a winner, Rob. I am liking ebonite more and more. Nice choices. Extra nice pen Rob! well done with kit and blank match up. Great looking pen and good photography to show it off! You must have had a good teacher. 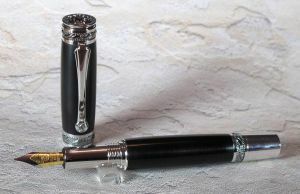 Great looking pen, very elegant.